Illinois has one of the worst overdose deaths rates in the country. In 2016, 1,889 Illinois residents died from an accidental drug overdose. For these numbers to go down, awareness, action, and access are critical. International Overdose Awareness Day has been a key remembrance event for those who have died from fatal drug overdoses since 2001. On August 31, thousands of people worldwide will stand beside the friends and families of fatal overdose victims to reflect on their losses. The event intends to reinforce the idea that no one need feel shame or disgrace at the death of someone from drug overdose. 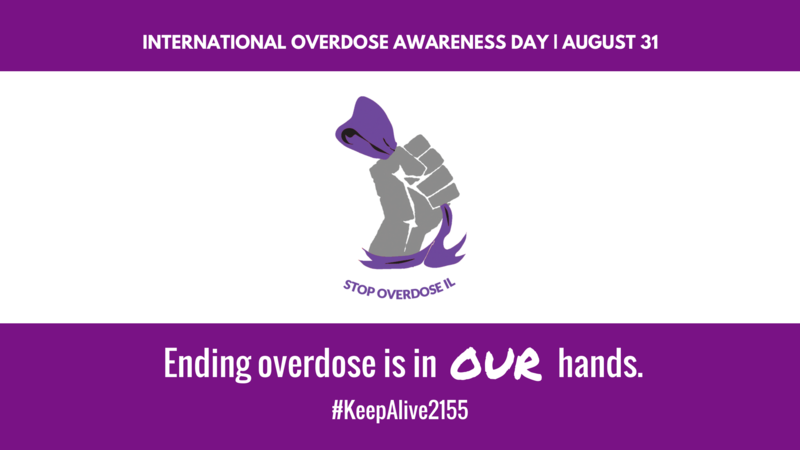 International Overdose Awareness Day also presents an opportunity to help the wider community understand that drug overdose is a social issue and no one is immune to drug harms. The number of fatalities from drug overdose deaths is growing and August 31 is a chance to inform about risky drug use and lifesaving drug overdose prevention supplies, such as Narcan or naloxone, the overdose reversal medication. From August 27-31, 2018, advocates from across Illinois will band together to train 2,155 people in overdose prevention and reversal strategies and equip people who need naloxone with a free kit. Why 2,155? The Illinois Department of Public Health projects that 2,155 Illinois residents will die from an accidental overdose in 2018. How can you participate in #KeepAlive2155? Contact Artemis Golzar at [email protected] or 844.584.5254 x808 to receive your IOAD 2018 toolkit and discuss naloxone/overdose prevention training needs. From hosting trainings to launching your candlelight vigil or remembrance event, it’s all in there! Visit our International Overdose Awareness Day Google Drive for more information, ideas, social media graphics, and more! For more events, please visit the Stop Overdose IL page on Facebook, or the IOAD official webpage’s List of Events.